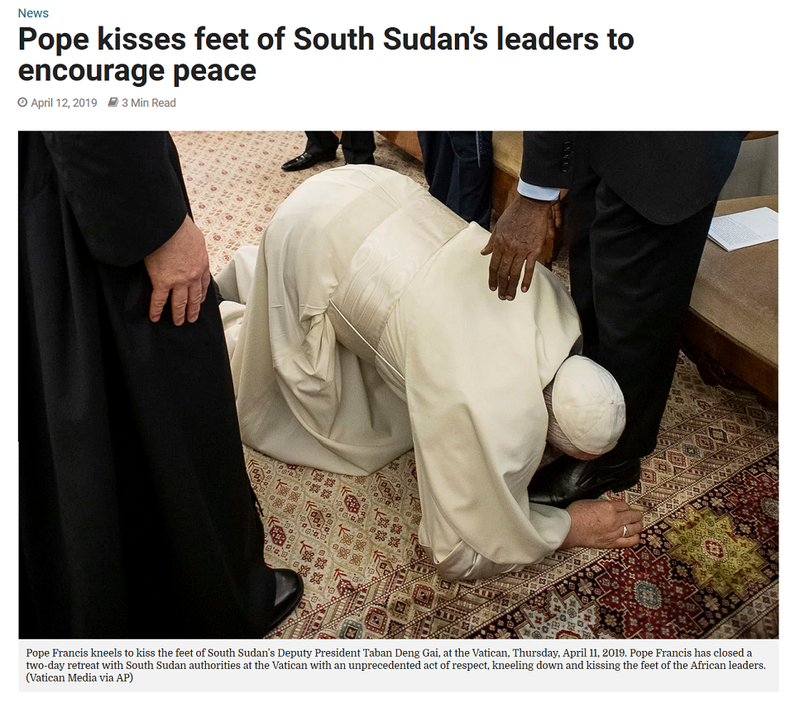 Featured Any Catholic Out There Want To Explain This Rather Peculiar Feet-Kissing Behavior? Discussion in 'Religious News' started by Skwim, Apr 14, 2019 at 1:55 AM. So what do you think was going through Francis' mind at the time. "If I kiss his feet perhaps it will bring peace"? . . . . . . Really? But I gotta tell you, I'd be kind of embarrassed if someone knelt down and kissed my shoes in public. Kind of an "Err Pope, c'mon. . . . . . Please get up.. . . . That's enough now." moment. And because I'm not all that familiar with Catholic practices I have to ask, Is this a common method of accomplishing Papal goals? An ex-Catholic speaking. Catholics practice ritual washing of the feet on Maundy Thursday but Ì've never heard of kissing of the feet. Well...here the Romans are quite angry and say they miss Ratzinger. I think it's intended to be a gesture of humility. Mary Magdalene once washes Jesus feet with her tears and kisses them repeatedly in full view of the other disciples. He is effectively trying to kiss Jesus feet by kissing theirs. Recently he has seemed confused about whether people should be kissing his ring. Perhaps this kissing of feet is related, maybe an act of humility. Well that is just ew. If not, it was for the cameras. He's humbling himself before them, giving away all the regular face in hopes that they too will be able to set aside their face and be for mutual benefit. It's a nice idea, but I don't think it will work. If it does, then it's wonderful. He's not kissing them, He's licking them clean. And this is not the first time that Pope Francis has done this. He stirred up scandal by kissing the feet of a Muslim and others in 2016. Only if you come down with athlete's tongue. Humility is one thing...the lack of arrogance. But kissing feet strikes me as degrading. Maybe it's best that we all should be humble much of the time. Even though Einstein didn't believe in the "God of Abraham", he nevertheless felt that doing so was an act of humbleness in recognizing that there's somethings out there that are much larger than us, thus lowering our natural penchant for egocentricity. If one knows somethings about Pope Francis' personal history, they would realize that such humbleness on his part became very much whom he is, coming from a relatively wealthy family but then having his eyes opened with working with the poor in Argentina. So, maybe we all here need to practice that humbleness more and also be less judgmental of others, don't you think? After all, it was Jesus who said "judge ye not...". I have a friend who is Freewill Baptist. They practice "Foot washing" as one of their rituals. The thought of handling someone's nasty feet freaks me out enough, much less kissing them. Sounds like a strange fetish. The thought of handling someone's nasty feet freaks me out enough, much less kissing them. Sounds like a strange fetish. Depends on what she looks like. Although I am somewhat fearful of getting toe-main poisoning. At their first meeting, Pope Paul VI kissed the feet of Metropolitan Meliton, the representative of Ecumenical Patriarch Athenagoras (Eastern Orthodox Church). When the metropolitan tried to return the gesture, the pope would not let him; it was a show of extreme humility by the pope. "... he got toe-jam football... "